In this interview Brian O’Connor speaks to AZoNano about how piezo controller design influences thermal stability. Can you give a brief overview of Aerotech, the markets you serve and the types of products that you produce? Aerotech manufactures motion control and automation solutions for a variety of industries. Our products provide critical performance improvements for demanding applications in markets like medical device manufacturing, consumer electronics, optics and photonics, additive manufacturing, laser processing, and test and inspection. We provide component-level solutions like drives and controllers, motors, positioning stages, hexapods, galvanometers, and piezo nanopositioners, as well as integrated sub-systems where we use these motion technologies. If you are trying to solve a precision automation problem, we likely have a solution for you. Could you please explain the basic theory behind how piezo controller design influences thermal stability? Thermal management is critical in precision processes. To achieve long-term stability with capacitance sensor feedback piezo stages, it is well-known that a robust mechanical design is necessary. However, most users don’t realize that the piezo controller design can have a large effect on the thermal stability of the instrument or machine since critical feedback signals are created and managed on the system controller. 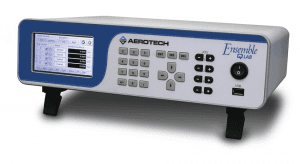 Aerotech has designed our A3200 and Ensemble QLAB, QDe, and QLe controllers with an advanced thermal stability feature that makes the capacitance sensor feedback circuit largely insensitive to environmental changes. How do Aerotech’s piezo motion controllers reduce thermal instability? The exact design details are proprietary, but at a very basic level, we designed a unique circuit that makes the feedback largely insensitive to both external environmental effects as well as heating inside the controller packaging. What are the advantages of the QLAB Stand-Alone Piezo Motion Controller? The Ensemble QLAB controller is both a high-precision and powerful piezo motion controller as well as user-friendly and easy-to-use. High-performance features include a high-precision 20-bit sensor resolution, a thermally-stable feedback circuit design, powerful control features such as learning control, harmonic cancellation, and command shaping that improve tracking error and overall process throughput. Features making the QLAB easy-to-use include a touch screen with an intuitive menu-driven interface as well as a Windows-based remote diagnostics, tuning, and programming interface software. Aerotech’s Ensemble software includes a one-button tuning called EasyTune™ that performs advanced loop shaping automatically so the user can get up and running in seconds with the highest-level of performance. Various programming interfaces include C#, VB.NET, C++/CLI, LabVIEW, MATLAB, EPICS, or TANGO. How do these advantages differ from other piezo controls on the market? We believe that the QLAB controller combined with our Q-Series piezo stages are the highest performing piezo solution on the market. When Aerotech designs motion solutions, we take the approach of “just another axis”. This means, our controller architecture is designed to accept any type of motion technology and to perform highly synchronized and coordinated motion with these various motion technologies (piezo, servo, stepper, galvo, hexapods, etc.). For example, our controller solutions easily allow the user to coordinate motion at sub-millisecond trajectory rates for a piezo stage and servo stage or a piezo stage and galvo system. Many other solutions on the market rely on the user to integrate these disparate motion technologies together which is costly and time-consuming. Are there any recent examples of how your piezo motion controller has been a success? Our piezo systems have been recently deployed in high-precision scientific research as well as industrial processing such as semiconductor manufacturing. As many industrial processes require constantly shrinking tolerances and features (ex: Moore’s Law in IC manufacturing), high-precision and thermally-stable nanopositioning solutions become vital to the success of the manufacturing operation or research. Aerotech’s piezo solutions are enabling many of these cutting-edge processes. Who do you think will benefit most from your piezo motion controller? As stated in previous questions, we are seeing users benefit from our Q-Series products in many different applications (scientific research, semiconductor processing, electronics manufacturing, etc.). Really, any application or research that requires the highest-level of stability and accuracy will benefit from this product. As our motto says, we are “Dedicated to the Science of Motion”. We will continue to develop the very best motion systems and components for the markets we serve while taking into account the rapid advances in computing power, materials science, and all other disciplines involved in motion control design and manufacture. 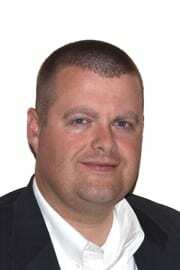 Brian O’Connor is Director of Product & Market Development at Aerotech where he is responsible for product management and business development activities. Brian has been a part of the Aerotech team since 2002 and has held various development engineering, engineering management and product management roles. He holds an MSME from Pennsylvania State University.